Alleviating poverty is not a simple goal. Rather than develop a model based on theory and then trying to implement it, our model has grown directly from our experience partnering and working with villages to build sustainable futures. Shanta’s ability to help begins with our belief in the existing agency of villagers; that they have the potential to identify and solve their own problems. And our innovative model works effectively at the grassroots level with an entire village to build a path out of poverty. Essential to the success of our six-year village partnerships is our local Myanmar team of skilled and compassionate Burmese staff who have been personally mentored and developed for the last 10 years by our founders, Mike and Tricia Karpfen. Shanta’s ability to help begins with a belief in the existing agency of villagers; that they have the potential within themselves to identify and solve their own problems. Villagers go from seeing themselves as having their life defined by extreme poverty to experiencing the ability to choose, influence, and contribute to the creation of new opportunities for their family and village. Shanta partners with the community to build capacity and create village-wide opportunities in education, local health care, livelihood, leadership, and infrastructure. Trust-building between Shanta staff and villagers occurs as the partnership progresses. Village interactions transform from hierarchical decision-making in small groups to large group activities that promote inclusivity and value input from all community members. We listen to build trust, gauge interest, and understand the village’s unique goals and concerns. Once we both agree to a six-year partnership that includes a co-investment of funds, Shanta helps villagers organize into teams and committees, create a shared future vision, and identify common goals. Shanta builds capacity by empowering local leadership through trainings, coaching, and support. Villagers accomplish their development goals, learning new skills and critical thinking through successes and challenges along the way. 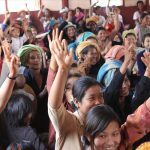 At the completion of our partnership, Shanta staff join the villagers to celebrate successes, create long-term strategies for developing independently, and agree to a supportive monitoring schedule. An annual investment of just $27 per person provides life changing opportunities at an impressive cost-benefit ratio. To encourage ongoing and thoughtful review of Shanta’s methods and processes, we developed an innovative M & E strategy that tells us what’s working, what impact we are having, and how we can improve. Celebrate clean water with us!